Poker's Plank, "Where it's fun to go all in!" Update 2018: Poker's Plank is closed. 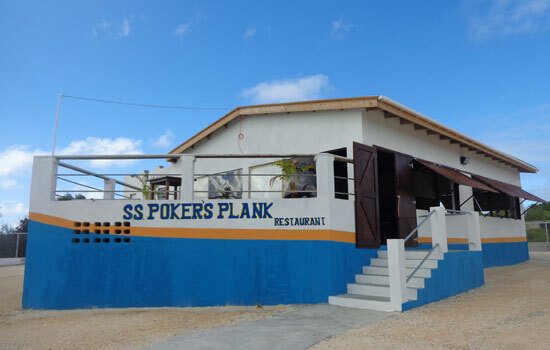 Set in a building shaped as a ship, Poker's Plank is Anguilla's only restaurant with a pirate theme! 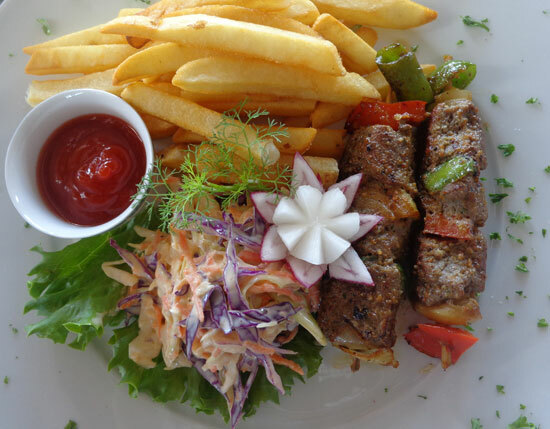 With a spacious and comfortable building, warm and friendly service, and plenty of menu options, this affordable and tasty spot is a good choice for families and those seeking a fun dining experience. Both Nori and I are drawn to a pirate theme. 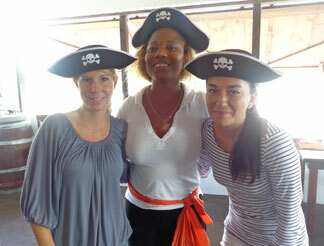 So, when we heard word of a pirate-themed restaurant in Anguilla, our curiosity was piqued! We had to try it out. Anguilla's Cove Road is the address for Poker's Plank. Drive/follow signs as though you are going to Smokey's On The Cove. While driving down Cove Road you will see Poker's Plank on the right. This building is located on a corner and in a fenced lot. The fun part is that the building resembles a ship and has outdoor seating on what would be the stern. From the stern, you can see over to St. Martin. 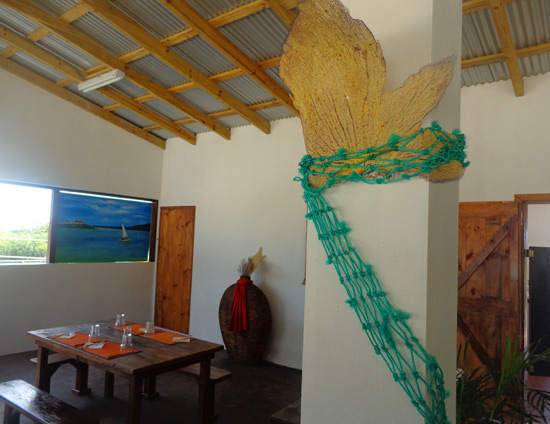 Decorated in the colors of Anguilla's flag (orange, white, and blue), the covered yet open-air interior is tastefully done. Inside, there are a couple of themed paintings and neutral pieces accented with the theme colors. The bar area is wooden. We found this to be a nice balanced place for both adults and children due to the theme and the spacious dining area. As we entered the building, Doreta (the owner) greeted us with a great smile. She was dressed according to the theme! Nori and I were immediately jealous of her pirate hat. She offered us nice, clean pirate hats to wear as we dined, if we chose. Doreta then presented us with the menu. The first items listed were 4 different salads (caesar, garden, caprese, and seafood) and a breaded shrimp appetizer. Those were followed by a full section of burgers, sandwiches, and pizza. Quesadillas were included as well and all items are served with french fries and cole slaw. Best of all, they range in price from $5 US (for the veggie quesadilla) to $14 US (for a steak sandwich). 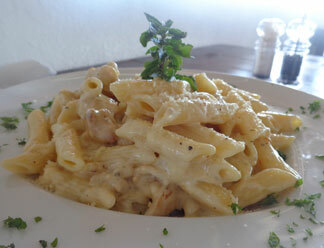 The menu rounds out with a selection of pasta, chicken, meats, and seafood. Here, prices range from $8 US (for the fried chicken chicharon) and $34 US (for the grilled crayfish) with averages being around $16 US. Nori sampled the steak kabob and I chose the chicken pasta. When Doreta brought out the creations of her chef, Santiago, the presentation was exceptionally pretty and the food was flavorful. 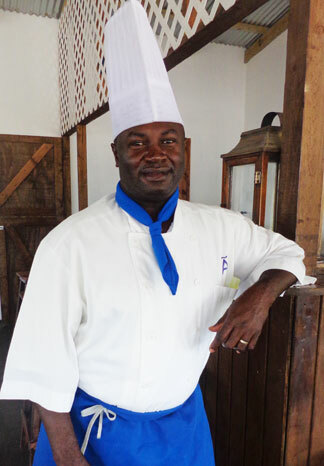 Chef Santiago knows his way around the kitchen, having worked for years at the high-end Anguilla villa hotel, Sheriva Villas. When we had finished, Doreta gave us a dessert menu to look at. So pleased with and full from lunch, we had to decline. Not that the desserts were not tempting... creme brulee, molten chocolate cake, cheesecake, apple pie, and ice cream. Those are some beloved classics! After paying the bill and saying goodbye to Chef Santiago and Doreta, we walked up to the "stern" of the restaurant and took in the view... the water beyond Cove Bay and a side view of the luxurious Villa Modena. Sunsets must be special from Poker's Plank! Directions: Head down Cove Road as if you're going to Smokey's on the Cove. About half way down that road you will see Poker's Plank on your right, behind a frost fence. Hours: Open for lunch and dinner. Closed Tuesday.